Another view of a ruined London in a distant future. Like Will Self’s The Book of Dave, J.G. Ballard’s 1962 novel The Drowned World also considers a vastly changed city. With global temperatures soaring, London is drowned by advancing waters as giant alligators, snakes and other primeval nasties slither into view to reclaim the world. A band of scientists decide to stick around, charting the changes to a just about recognisable landscape of submerged department stores and tower blocks. Where Self uses modern landmarks to sketch out his future – the wheel on the South Bank features prominently – Ballard has his cast seeking refuge at the top of tall buildings, and the Planetarium – perhaps a more potent symbol in the early 1960s of Man’s imminent conquest of the stars – is reduced to a dark and menacing underwater cavern. The celebration of outer space becomes trapped in inner space, explored by divers in space age protective suits. The Drowned World is a well written science fiction novel, but I was disappointed by its lost opportunity to exploit the landscape of London just that little bit more. The premise reminded me of one worthy of H.G. Wells, but – like the devastation in War of the Worlds – the Master would have relished in the chance to describe the city, district by district, as it was claimed by the sea. Ballard also doesn’t delve deeply into why this ecological disaster has occurred; it’s a natural one caused by solar flares (or something equally vague), rather than Mankind bringing it upon himself (he fails to predict the concerns of climate change that a modern novel would eagerly seize upon). Ballard’s interest lies in suggesting human degeneration, something that would have certainly interested Wells. Deep within us all lie fears of the primeval swamp, an innate terror of the reptiles and insects that lived on the Earth millions of years before us. As London is engulfed in water and rising temperatures, these fears also rise in Ballard’s cast – making interesting reading as they slowly succumb to nighmare and madness. All these years on, The Drowned World survives as a worthy effort to produce a celebral and quality science fiction novel, a hard objective in the sci-fi weary world of the early 1960s. Maybe because of this Ballard treats his subject a little too seriously, there’s room for humour in even the most inhospitable of landscapes – at least on the page. There is also an uncomfortable shift into Heart of Darkness territory towards the end of the novel; an unwise move as it will always be impossible to emulate Conrad. But The Drowned World does have an effective ending, and it’s worth reading, especially as its author had boldly chosen to stick with a genre unfashionable at the time. Admirable. My children were at the centre of my life, circled at a distance by my writing. I kept up a steady output of novels and short story collections, largely because I spent most of my time at home. A short story, or a chapter of a novel, would be written in the time between ironing a school tie, serving up the sausage and mash, and watching Blue Peter. I am certain that my fiction is all the better for that. My greatest ally was the pram in the hall. But childhood has gone, and in the silence one stares at the empty whisky bottles in the pantry and wonders if any number of drinks will fill the void. But Ballard doesn’t spend too long mourning what’s gone, and although there are many dark moments in his life, this book is a joy to read. He was born in Shanghai in 1930 and spent the first sixteen years of his life there, several of them in a prison camp when his family were interned by the Japanese during the Second World War. His experiences formed the background for his most commercially successful novel, Empire of the Sun, although anyone familiar with this work should still read Ballard’s new autobiography. It’s a very straightforwardly written yet immensely moving memoir, following his life after the war through medical school, the RAF, family life and success as a writer. He doesn’t dwell on the horrors he witnessed first hand (such as the murder of a Chinese peasant by Japanese soldiers that he stumbles across at a railway station) and he doesn’t try to pry too deeply into the influences that have shaped his writing (surrealism, Freud, the grisly cavadars he encountered as an anatomy student). Miracles of Life reminded me what an unpretentious writer he actually is – and an obviously warm hearted man. 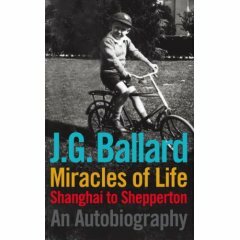 The bulk of Miracles of Life covers the years up to the 1960s; as Ballard grows older time passes very swiftly and the last 20 years are covered in as many pages, although he still manages to include interesting passages on working with Spielberg and his return visit to Shanghai in 1991. There’s also many interesting snippets of his life, such as his volatile friendship with Kingsley Amis and his current literary pals – one of his best friends is Will Self. His oddest associate is probably the young man called Cyril he knew as a fellow internee in Shanghai, who dreamt of changing his name to something more theatrical and becoming a famous actor. Cyril later became Peter Wyngarde, the camp and dashing 60s tv star Jason King. It might be too early to talk about books of the year, but Miracles of Life is just that – very readable and enjoyable. The final pages, when Ballard reveals the urgency for writing the book, are also very moving. I couldn’t recommend this book enough.